The families of the fallen government troops in Marawi City have received at least P1.25 million each in donation from the country’s top businessmen. 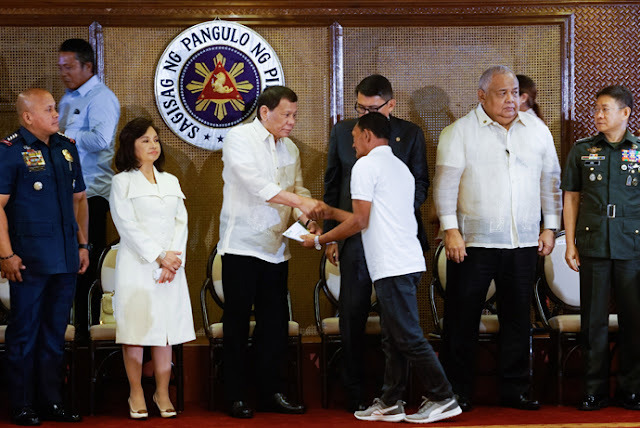 President Duterte has announced that one of the businessmen donated P1 million to each of the fallen troops’ family but has asked not to be identified. Duterte, in his remarks at the turnover ceremony of the financial aid, praised the anonymous donor’s generosity and magnanimity, adding the person will certainly go to heaven. The remaining P250,000 for each of the soldiers’ families came from rich businessmen belonging to the Go Negosyo Kapatid for Marawi. Around 250 families representing the 101 fallen soldiers and policemen gathered in Malacanang for the turnover ceremony of the financial aid from the Go Negosyo group. Hotel and travel accommodations were shouldered by the businessmen. The President extended his condolences to the families, saying the Philippines will be “forever grateful” for the heroism and sacrifices of the fallen troops. “I would like to extend my sincerest condolences to the families of our troops who perished fighting for the liberation of Marawi,” he said. “I know that no amount could equal the precious lives of your loved ones. May you find solace in the fact that the whole nation condoles with you in these trying times,” he added. He also extended gratitude to the partners from the private sector for their participation in the rehabilitation of the city of Marawi. To troops still fighting in Marawi, the President urged them to remain strong in heart and mind. “Honor your fallen comrades by making sure that your sacrifices will not be in vain. And do not be killed,” he added. Presidential adviser on entrepreneurship Joey Concepcion said the financial assistance to the grieving families was aimed to honor their fallen loved ones and show solidarity with their grief. “Through this occasion, we want to honor these courageous souls by showing that their fellow countrymen – from the government to the business sector – have not forgotten about their ultimate sacrifice and their loved ones who miss them dearly,” Concepcion said. The same Go Negosyo Kapatid network pooled resources to extend support for soldiers battling militants in Marawi City. More than 5,000 care packages, including food and water, have also been distributed to the displaced families in the area. Among the Go Negosyo businessmen were Tessie Sy-Coson of SM Group, Josephine Yap of Filinvest, Jaime Zobel de Ayala of Ayala Corporation, Manny Pangilinan of PLDT/Smart Foundation, Alfred Ty of Metrobank Foundation, Jean Henri Lhuillier of Cebuan Lhuillier, Mildred Vitangcol of St. Peter’s Chapel, Alice Eduardo of Sta. Elena Corporation, Federico Lopez of First Philippine Holdings, Michael Tan of Asia Brewery and Philippine Airlines, Tony Tan Caktiong of Jollibee Foods Corporation, Injap Sia of Double Dragon Properties, Joey Concepcion of RFM Corporation, Jojo Concepcion of Concepcion Industries, William Belo of Wilcon Depot, Dennis Uy of Chelsea Logistics, Santi Araneta of LBC, and Sabin Aboitiz of Aboitiz Corporation.